Stuart Turton is a freelance journalist who lives in West London with his wife and daughter. 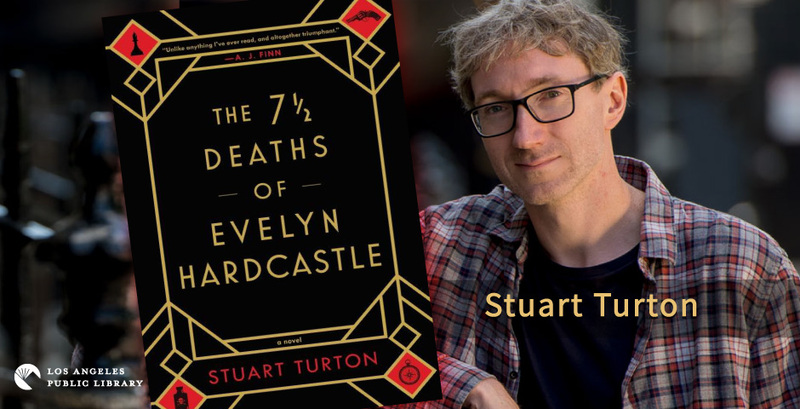 Stuart is not to be trusted—in the nicest possible way.The 7½ Deaths of Evelyn Hardcastle is his debut novel and he recently agreed to be interviewed by Daryl Maxwell for the LAPL Blog. What was the inspiration for The 7 ½ Deaths of Evelyn Hardcastle? I’ve wanted to write an Agatha Christie-style mystery since I was eight years old, when I used to read them one after another in my bedroom. I tried when I was 21, but it was rubbish. I was just flinging Christie tropes onto the page without adding anything unique of my own. I realized I needed a twist, so I decided to put the book down until I had something that would make the story stand out. I thought that idea would take a week, maybe a month. Twelve years later, I was on a long flight when my mind wandered back to this book I’d always wanted to write. Usually, when that happened, my thoughts hit a brick wall, but this time the concept was waiting for me. Agatha Christie in a Groundhog Day loop, with a bit of Quantum Leap thrown in. All I had to do then was find characters, the plot and a clever murder… no problem. I’ve noticed that the title in the UK is The 7 Deaths of Evelyn Hardcastle? Why is the US title different? Which title do you prefer? The US title is different because it came out after a book called The Seven Husbands of Evelyn Hugo and we were trying to avoid too much confusion. Our plan hasn’t entirely worked, to be honest! I get so many people telling me they bought one, meaning to buy other. Some people think 7 ½ Deaths is a sequel or a prequel to Seven Deaths, or Seven Husbands. I’ve heard great things about Evelyn Hugo, so hopefully people have enjoyed both—even if they did read one by mistake. In terms of preference, I love both titles. They’re both creepy and intriguing, and that’s exactly what you need a title to be. Because the entire novel is set in this one repeating day, the timeline is everything! Everything has to happen at exactly the right time to make the plot work, otherwise impossible things tend to start piling up. I spent three months planning it before I ever wrote a word, including creating a spreadsheet that detailed every two minutes of every character’s day, which I then plotted on a huge map of the house and grounds. I stuck rigidly to that plan throughout. The one time I tried to freestyle, I ended up having to throw away 40,000 words (about three months’ worth of work) because they led me into a plot pit I couldn’t climb back out of. To answer your question, anything that was lost I was happy to see the back of because it was like walking into a forest of thorns. Are Aiden, Anna, or any of the other characters/hosts inspired by or based on specific individuals? What was the inspiration/reason for dressing the character who assists the protagonist in a Plague doctor mask? For people who don’t know, Plague Doctors tended plague victims during the 17th century. They wore long black cloaks and these beaked masks stuffed with cloves intended to protect them from contracting the plague themselves. Can you imagine? These doctors wanted to help, yet they turned up in the scariest costumes you can ever imagine. I reckon most patients would have been saying “actually I’m fine thanks, feeling much better now, you can see yourself out, right?” It just seemed perfect to dress my guide character like that, because you never know what he really wants, and whether he’s a friend or foe. I’ve got a five-month-old baby, so my nightstand is just a stack of books at this point. I’m currently reading The Witch Elm by Tana French. Then I’m going to read Normal People by Sally Rooney. Between feedings, nappies, crying, playtime and doctor visits, I fully expect to finish that by 2031. I loved everything Roald Dahl wrote when I was a kid. My favorite was probably the first one I read, which was Danny, the Champion of the World. I won’t spoil it for anybody who hasn’t read it, but it’s entirely wonderful. My parents were remarkably lax about books. Brilliantly, I don’t think they could ever conceive of reading being harmful, so I was allowed to read whatever I wanted without fear. They also had a rule that I could stay up as late as I wanted, so long as I was reading. As a result, I got through a lot of books! I was reading Stephen King when I was nine, Salman Rushdie when I was thirteen. They’d ask me what they were about; I’d explain, then they’d shrug and leave me to it. Every author has left a mark on me, so picking five who generally inspired my writing is tough. Squint at 7 ½ Deaths long enough and you’ll definitely see the DNA of Agatha Christie, Arundhati Roy, Arthur Conan-Doyle, Mervyn Peake, Franz Kafka, and Raymond Chandler. They were like reference texts. When I was struggling with mood, or setting, or just the structure of the novel, I’d go and read those guys to see how they did it. It was like having a brain trust in my study. Faked reading books? Do people do that? How? Why? There are so many books in the world, we’ve got the best reason in the world not to have read one. People could climb my TBR pile all the way to the moon. I buy most of my books for the cover. I recently bought the entire collection of Bloomsbury Modern Classics because they’re so extravagantly beautiful. I’ve got a poster of the Jonathan Strange and Mr. Norrell cover on my wall because it’s so awesome. Those first Agatha Christie books I read are directly responsible for my life today. They didn’t change my life. They were the seed it grew out of. There are so many books I’m evangelical about, I’m such a book bore. Most often I’m causing my friends’ eyes to glaze over by talking about The God of Small Things by Arundhati Roy, which is one of the few books where I genuinely believe every page is perfect. There’s such beauty in the writing and playfulness in the language. I’ve never read a comparable novel. I could live in a single paragraph of that book for months. It’s amazing. I’ve always wished I could read The Strange Case of Dr. Jekyll and Mr. Hyde a day after it was written in 1886. Nowadays that twist is part of our cultural consciousness. Everybody knows it or has seen it used elsewhere. When that book was first written, nobody knew what was coming. It hadn’t been done before. It must have blown people’s minds. I can honestly say I’m living my best life right now. I’ve worked really hard to get here, but my book’s going well enough that I’m now writing full time. Every week or so, I’m attending a literary festival or meeting other authors I love. My wife is a freelance journalist, so we spend our days together trying to work out what the hell our baby girl is doing. It’s awesome. We’re surrounded by our friends, we laugh a lot. Not sure what else I could ask for. I’m currently working on my second novel. I’d love to tell you more about it, but by the time I’m finished writing it will be something else entirely, so I don’t want to inadvertently lie to you. It’s going to be loads of fun though. That’s pretty much my goal with every book I write. I just want people reading until 2 a.m. with a massive grin on their face. If I’ve managed that, I’ve done my job. One murder, eight days, eight hosts and one chance. In his debut novel, Stuart Turton tells a Rubik’s cube of a novel with elements from different genres where the protagonist must live the same day eight times, each time as a different person, to solve a murder. To misquote Winston Churchill, this is “a sci-fi, wrapped in a mystery, inside a thriller.” First time novelist Turton makes it look easy to seamlessly combine these disparate elements of storytelling into a novel that becomes a page-turner, regardless of which genre’s elements may have tempted you into reading the story.